How do I lock the buttons on the right hand side bezel? Using the remote control press the red button, to confirm that the operation has happened you will see a message on the Clevertouch telling you that it has either locked or unlocked the buttons. My new screen only displays the message 'No Input'. There is no android system available. Please check that the android module is fitted in the slot to the right of the screen. The module is delivered in a separate box and must be fitted during installation of the screen. I cannot access the Cleverstore, what could be the problem? If you can browse the Internet successfully using the Browser app, please check the date & time are correct in the Android Settings app. If step 1 is ok then please check that the following URLs are permitted through your network: - https://prod.sahara-admin.appcarousel.com/api/v1/export-products, https://prod.sahara-admin.appcarousel.com/api/v1/export-categories & https://sahara-stage-public.s3.amazonaws.com. The Cleverstore app connects to our servers over port 443 (standard https) and port 80 (http). 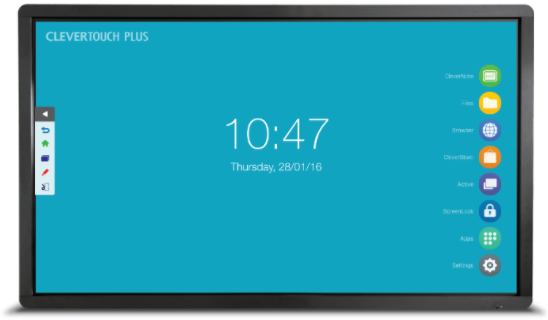 How do I integrate Clevertouch onto my network? Please take a look at our Clevertouch Network Requirements document, which can be found within the Drivers & Downloads section on the right of this page. Since the September OTA update for Android Modules running v5.1, *Build number saharaedu 5.1.1 eng.iip.20170908.212017 for Plus and *Build number saharameeting 5.1.1 eng.iip20170909.095355 for Pro, iMirror is no longer be available to use as an application, although it is running in the background. Please use our new app Clevershare to remotely connect mobile devices and PCs to the Clevertouch screen. *To confirm which Build number you are running open Settings app, then touch About.